Today is the first day that it really feels like fall here in Nebraska. The air is crisp and there is a slight breeze. When fall comes, I can’t help but think of fresh apples and all of the great recipes that you can make with them during this time of year. Please enjoy the roundup that I’ve put together of great apple recipes I have found! Click the photos to visit the sites and view their recipes. These sites have amazing recipes, so I highly suggest staying and browsing their entire recipe section! Every year I make up a big batch of apple cider in my crockpot. I usually use apple cider, red hots and cinnamon sticks. These apple cider cups embellished with a cinnamon stick would be the perfect during family game night or when you are huddled around a warm fire. 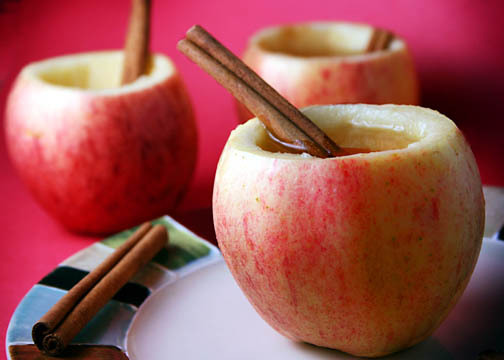 What a fun way to drink apple cider! These are the most perfect, natural looking, mini caramel apples I have seen! What a creative way to display a tasty snack. Mini caramel apples are among one of my favorite snacks this season! Mostly because I never seem to finish an entire huge caramel apple and regular sized ones are more sticky and a challenge to eat. Don’t these just look wonderful? While I’m not a fan of regular apple pie, when mixed with caramel I am in love! 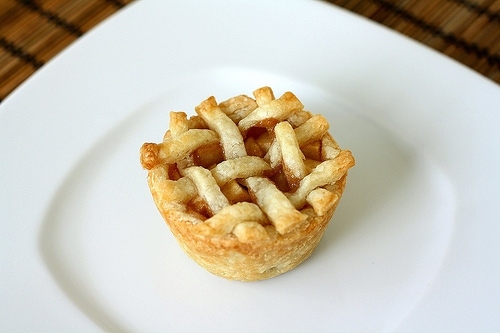 These tiny pies would be the perfect portion size for your holiday dinners and much easier than cutting a large pie and trying to fight over who gets the most filling! The lattice work on the top of these makes them look complete. I just love this recipe and cannot wait for an excuse to make it! Don’t these apple rings look phenomenal? I love dipping my snacks and this recipe includes a cinnamon based icing to dip them in, or drizzle over the top of them. YUM! I think I’m going to make these the next time we are invited somewhere for a football party. I have to admit the photo was what drew me to this recipe, but I cannot wait to try it out! The author not only suggests using it on pastries, but also as a glaze on meat. Doesn’t it just sound tasty? I will definitely be making up a batch of this to use this winter! What are some of your favorite apple recipes? What new ones have you found that you will try this year? 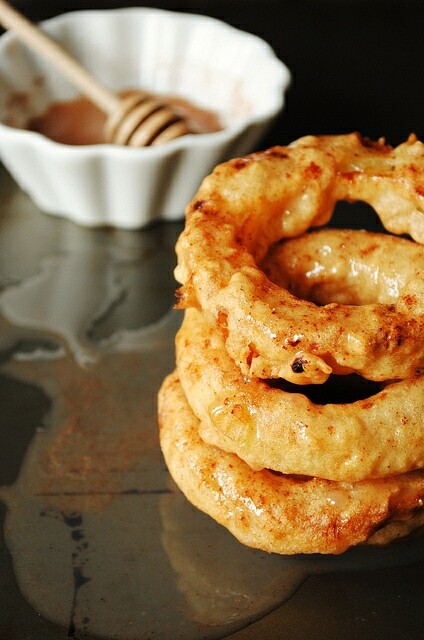 Thank you so much for including my apple rings recipe and photo! What a fantastic way to kick off fall. I love all of these apple recipes! Thanks for being part of the roundup! I tried those apple rings. PHE-NOM-NOM-MINAL! The apple rings look amazing! Think i’ll have to try that one! How creative! 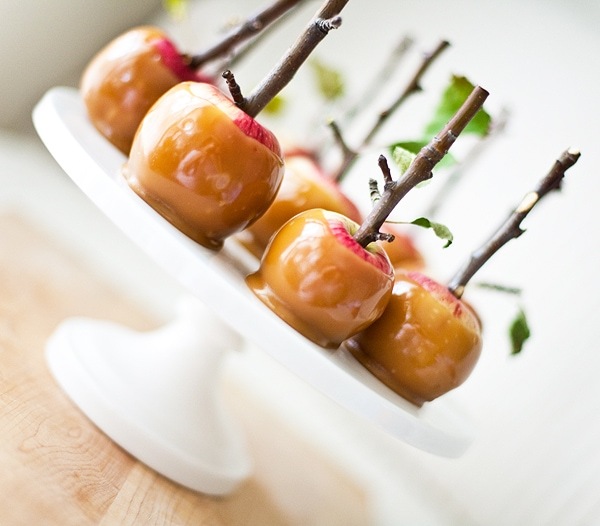 I love the little mini apple pies and the caramel apples with the sticks in them. It all looks wonderful! Thanks! We are happy to have you as a part of the roundup! These are awesome! I have a bunch of apples in the fridge right now, maybe I’ll try making something with them. Those apple rings look really good! So many great ideas! 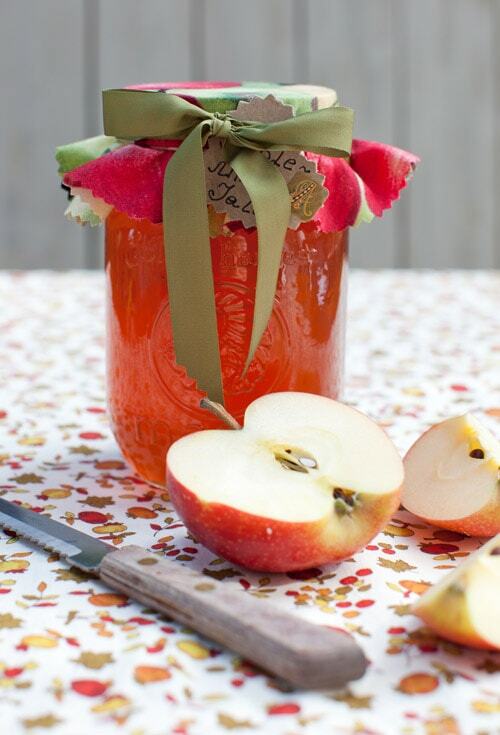 I’ve got so many apples in the garden that I need lots of new ideas for using them up! So many delicious looking things here! I definitely plan to try a few. Great round up. Perfect timing, as I just went apple picking today! Now, I have lots to choose from. Thanks! Thank you for putting together such a unique bunch of recipes! I absolutely love them all and can’t wait to try them and also read all these new blogs. Awesome!! I didn’t realize you could do such amazing things with Apples! Yum.. I always love new apple recipes! I grew up on an apple orchard, and I always thought that I’d used apples in every possible way, both tasty and ridiculous. I love that you put apple cider into hollowed apples with a cinnamon stick stirrer like soup in a bread bowl! Wasn’t that creative? You will have to go visit Emily’s blog for more great recipes! The apple cider cups are my favorite! You can even eat them when your cider is gone and it will have a better flavor! So glad I found you on Stumbleupon! Your blog is great! These fall recipes make my mouth water! Thanks for stopping by! I always wonder where my visitors are coming from. I love Stumble Upon, I find a ton of great recipes on there! Hi- I really enjoyed this post. I recent went apple picking and we bought over 30 lbs of apple. We’ve been trying to figure out what else to make besides your basic apple pie and apple crisp. These new Ideas a great! Love the apple cider cups! We do apple cider for Thanksgiving morning on the front porch. I’m adding this to our tradition. These all look so good, it’s making me excited for fall! The apple cider cups are on my to-do list. This post has me so excited for fall and all of the baking options. Great round-up! I am very happy to read your recipes. It’s very useful for me, and I am completely satisfied with your website. All recipes and food information are very useful and very good. Your website is very attention-grabbing. I love all of the in turn you are sharing with each one! I have one more apple dessert. Apple Dumplings Stuffed with Dry Fruits and served with Homemade Caramel Sauce. A treat to tempt the most determined dieter. Looking attractive & delicious. worth to try it. MMMM The Apple Mint Jelly is my favorite post! Thanks so much for sharing, us mommas can’t get enough of the new ideas! Happy Fall from Austin, Texas!